Welcome to Central Coast Taxis. Central Coast Taxis provides a customer oriented 24/7 taxi service for residents and visitors to the district which spans some 1800 square kilometres from the Hawkesbury River to Catherine Hill Bay and the hinterland. The fleet consists of 89 taxis including 21 wheelchair accessible taxis (WAT). Wherever possible we offer passengers a choice of vehicles options for their transport requirements from our range of sedans, station wagons, WAT, and maxi taxis seating up to 11 people. Most vehicles are equipped a child car seat for infants up 12 months. All vehicles are equipped with MTData communications and navigational systems. Central Coast Taxis Call Centre utilises the latest technology in telephone and dispatch systems which offers a user friendly and seamless transition from booking to arrival of your taxi. We also offer web booking and the Central Coast’s only ‘Crime Stoppers approved’ smart phone taxi app. So you now have the option of booking your taxi with one of our friendly experienced operators, online (once registered) at our web booking page or via our smart phone app which is a free download from Apple or iTunes. Using the phone app, customers will now be able to look at the status of their booked taxi without the need to ring the call centre. 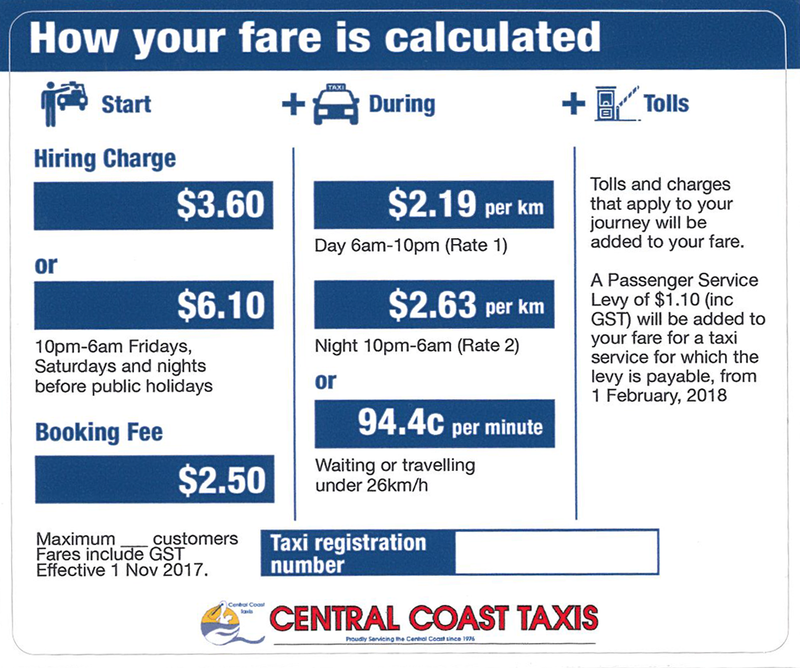 Central Coast Taxis has always endeavoured to cover all time booking as close to the pre-arranged time as possible but please be mindful of traffic delays when booking your transport for a specific time. Our maxi taxis are a huge success on the Central Coast but by regulation, these vehicles are first and foremost WHEELCHAIR accessible vehicles and will be booked as such and may not be available at your booked time. This is something that cannot be pre-determined at the time of your phone call when arranging a pre-booking. We hope you enjoy your travel experience in a Central Coast Taxi and look forward to seeing you on your next trip. Click here for more fare information, fees, terms & conditions.